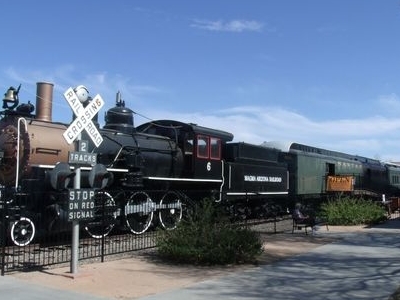 McCormick-Stillman Railroad Park is a 40-acre (160,000 m2) railroad park located in Scottsdale, Arizona. It features a 15" gauge railroad, a Magma Arizona Railroad locomotive, a railroad museum, three model railroad clubs and a 7.5" gauge live steam railroad. In 1967, the Fowler McCormicks donated 100 acres (0.40 km2) of McCormick Ranch to the City of Scottsdale stipulating that it be used as a park for all people to enjoy. The son of Anne and Fowler McCormick, Guy Stillman, assembled his 15" (381 mm) gauge narrow gauge railroad replica in the property. He called it the "Paradise & Pacific Railroad" and was offered to the city in 1971. 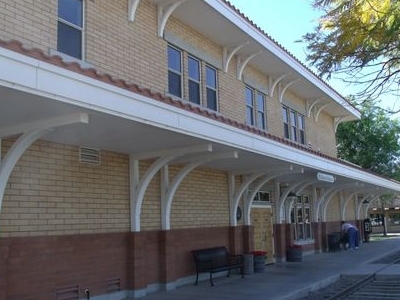 The U.S. Marines and Senator Barry Goldwater contributed in the railroad expansion. With their apportions to the railroad route expansion, the park officially opened the morning of October 4, 1975. The park's original name was McCormick Railroad Park, but in 1996 the park was renamed McCormick-Stillman Railroad Park in recognition of its founder, Guy Stillman. The City of Scottsdale sold 60 acres (240,000 m2) of the donated land to a developer several years ago. Paradise & Pacific Railroad: Created by Stillman, the Paradise & Pacific Railroad is the oldest and the first attraction to operate in the park. This 15" (381 mm) gauge train has a route of 3,800 feet (1,200 m) of track and 1,400 of sidetrack, including two trestles, a tunnel, water tank, loading platform, turntable, two crossing signals and an extensive train shed and workshop. The railroad has three steam engines,three diesel engines, two cabooses, a coach car, a trolley car, two boxcars and a large number of gondola cars. Charro Carrousel: This merry-go-round was built in 1950 by The Allan Herschell Company and was purchased and restored by the Scottsdale Railroad & Mechanical Society. Playgrounds: The park has two children's playgrounds, one of them Southwestern-themed in an adobe construction. Magma Arizona Railroad Engine #6: This locomotive was built in 1907 by the Baldwin Locomotive Works and operated in the Magma Arizona Railroad for 54 years. It was purchased by the Scottsdale Railroad & Mechanical Society in 1977 and is the only Arizona & New Mexico engine remaining in Arizona. Roald Amundsen Pullman Car: Donated to the Scottsdale Railroad and Mechanical Society by Mr. and Mrs. Franz Talley, it is one of six cars built by the Pullman Company in 1928. It was constructed at a cost of $205,000 and used by Presidents Herbert Hoover, Franklin Roosevelt, Harry Truman, and Dwight Eisenhower. President Eisenhower used the car exclusively during the whistle-stop campaign in 1952. It was on this car on August 18, 1940, that President Roosevelt and Canadian Prime Minister W.L. McKenzie King met and mutually agreed to the Ogdensberg Declaration, a declaration that provided for the joint defense of North America in the event of foreign invasion. That was the beginning of the North American Air Defense, also known as N.O.R.A.D. It was donated to the park in 1971. Gabe Brooks Machine Shop: Built in 1930 by Gabe Brooks, who was considered the finest machinist in the United States during World War II. It still contains original machining equipment. Navajo Hogans: These are two of the only three Indian hogans that exist off the Northern Arizona Navajo Indian Reservation. The other hogan is located at the Heard Museum in Phoenix, Arizona. Xeriscape Arboretum: This desert arboretum has been growing since 1980 and has different species of plants from different regions. Scottsdale Live Steamers: The Scottsdale Live Steamers is a 7.5" gauge miniature railroad which surrounds the Xeriscape Arboretum and was the former home of the Maricopa Live Steamers. The track is 3,000 feet (910 m) long and has a loading platform, a train shed, turntable, a tunnel and two trestles. The layout has two main loops: the outer loop passes over the tunnel and the inner through it. Each loop has a trestle. Scottdale Model Railroad Club: This club features a HO scale model train layout. Paradise & Pacific Tinplate Club: This club features an O scale model train layout. Sun-N Sand Club: This club features an N scale model train layout. 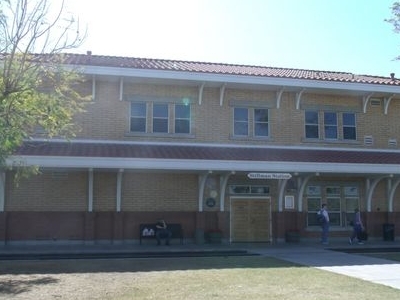 Here's the our members favorite photos of "Heritage Railway in Scottsdale". Upload your photo of McCormick-Stillman Railroad Park!